It takes a fair amount of mental gymnastics to frame Captain America: The Winter Soldier as an underdog. Like all Marvel Studios releases, it arrived with a built-in audience, a massive amount of goodwill, and a clear path to box-office success. But that didn’t guarantee anyone would love it. The Winter Soldier arrived on the heels of Thor: The Dark World, which was a pretty good movie, but also one of the weaker entries in the Marvel Cinematic Universe. It also suggested that the enterprise could be ossifying into formula. The Dark World had stunning production design and strong performances, but not much story, and not much that superhero fans hadn’t seen before. Its story felt familiar from past Marvel movies: Big Bad threatens world. Banter. Setpieces. Third-act fireworks. Tease for the next movie. 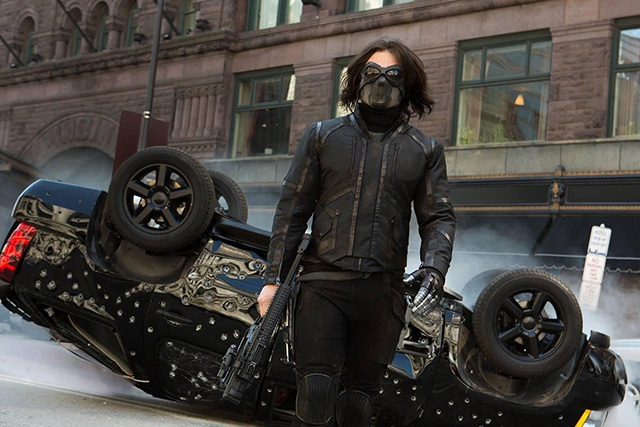 The Winter Soldier adheres to the same basic outline, but it’s set apart by the variations it finds on that formula, namely the addition of Marvel newcomers Anthony and Joe Russo, and a paranoid vibe borrowed from Watergate-era conspiracy thrillers. Wisely, Marvel decided to use these differences to sell it. The Russos are gregarious interviewees, and they started dropping references to Three Days Of The Condor and All The President’s Men as far back as conversations at 2013’s Comic Con. The casting of Robert Redford, the star of both those films, helped solidify the connection. Yet the Russos themselves remained an X-factor until viewers got an eye on the film itself. Veterans of comedy features (Welcome To Collinwood; You, Me And Dupree) and sitcoms (Arrested Development, Community), they seemed unlikely candidates to take over a superhero movie. Would they have the goods? They did have the goods. Working from a screenplay by Marvel veterans Christopher Markus and Stephen McFeely, the Russos’ direction excels both in character moments (which might have been expected) and in action scenes (which was harder to predict) and balances the two elements expertly. This was Chris Evans’ third film as Captain America, after Captain America: The First Avenger and The Avengers, and not counting a brief cameo in Thor: The Dark World. It’s the first, however, to spend any significant time addressing his new status as a man out of time, a hero who was encased in ice after World War II, and awakened in a strikingly different world. Evans captures the poignance of that situation particularly during a bedside visit to his WWII-era love Peggy Carter (Hayley Atwell). But he never lets the potential for melancholy overwhelm the character. His Cap, like the Cap familiar from years of Marvel Comics, is defined by his indefatigability and his commitment to the ideals on which America was founded. Much of the tension comes from the way the plot puts those ideals at odds with what America has become. Though it hides behind the fig leaf of the fictitious, Nazi-derived, evil organization Hydra, The Winter Soldier is informed by anxiety over America’s actions at home and abroad in the 21st century. Analogs of drone warfare and the incursions into privacy committed by the NSA find their way into the plot, as does a distrust for those in positions of authority, who may be following a hidden agenda. “We were all reading the articles that were coming out questioning drone strikes, pre-emptive strikes, civil liberties—Obama talking about who they would kill, y’know?,” Anthony Russo told Film Journal International. 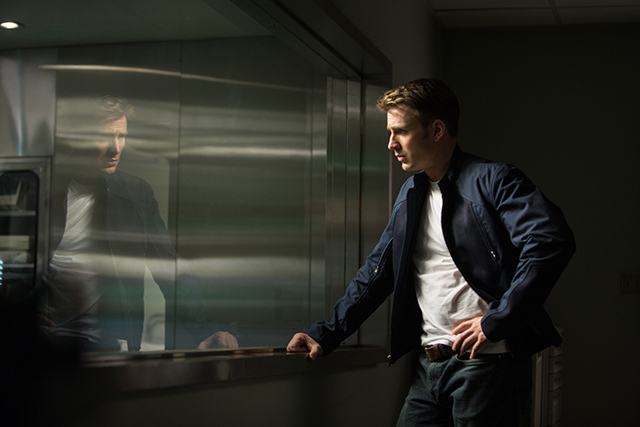 “We wanted to put all of that into the film because it would be a contrast to Cap’s greatest-generation [way of thinking].” It’s no surprise that Winter Soldier was able to graft the paranoid, disillusioned feel of ’70s political thrillers to a contemporary setting. It’s a natural fit. Both elements push Marvel movies in directions they hadn’t been before. Winter Soldier’s politics are muted, but they’re still audible, and Evans and others find an emotional depth to the material only hinted at in previous MCU efforts. 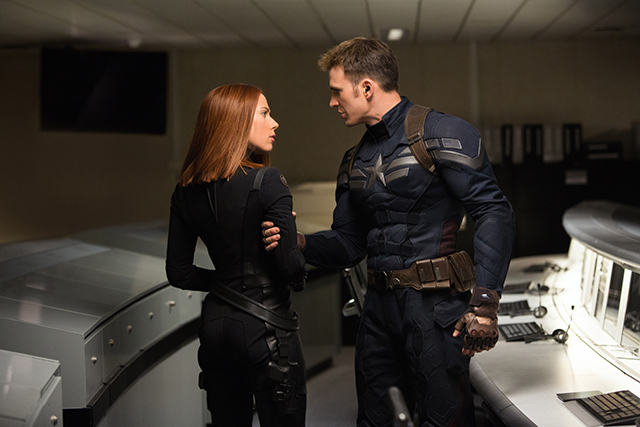 Beyond Cap’s scenes with Carter, he spends much of the film bonding with Black Widow (Scarlett Johansson) and Sam Wilson (Anthony Mackie), an Afghanistan veteran who assumes the mantle of The Falcon before the film’s end. 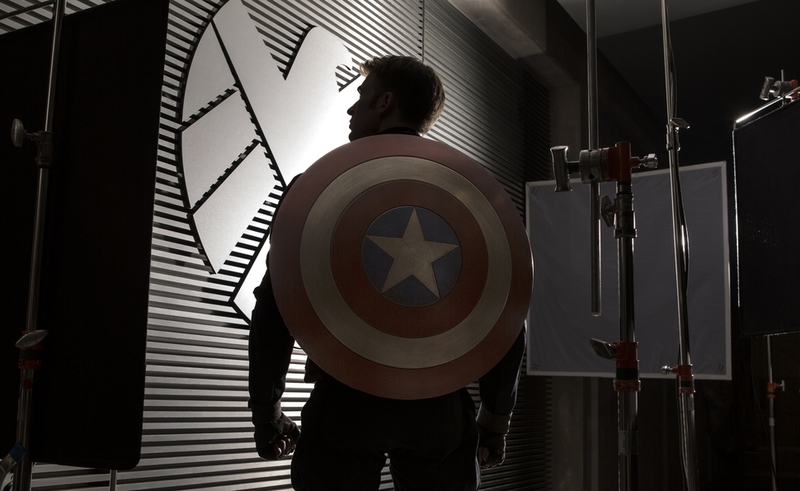 Like Cap, both have scars from their experiences that others wouldn’t understand. The film is just as assured over its action. From brutal, conservatively edited scenes of hand-to-hand combat to a couple of thrilling chases through the streets of Washington D.C., the Russos keep the action kinetic and visceral. It’s another case of pushing forward while looking back: A chase scene involving Nick Fury (Samuel L. Jackson), a supercar, and a bunch of grim-looking Hydra operatives owes a debt to the chrome-bending car chases of the 1970s, while still feeling contemporary. In its best moments, The Winter Soldier moves like a classic hot rod that’s been gutted and filled with state-of-the-art machinery. There’s a lot going on in The Winter Soldier, so much that some major elements have to take a back seat. Chief among them: The Winter Soldier himself. Though the revived, brainwashed Bucky Barnes (Sebastian Stan) gets a fair amount of screen time in the film, The Winter Soldier never lets his story drive the movie, either narratively or emotionally. He’s an important cog in its machinery, but still a cog. And, ultimately, the machinery tends to take over in even the best MCU films. The Winter Soldier builds to a climax that’s exciting, but relies so heavily on CGI effects that it feels at odds with the grittiness that’s preceded it. It also has to go about the business of putting all the pieces into place for the next film to feature these characters. Still, at this point, complaining about the way the movies have to contort themselves to fit into the bigger picture is a bit like complaining that pizza consists of a crust and cheese. What’s exciting about The Winter Soldier is the way it demonstrates how working within those parameters can still produce surprising movies with their own distinctive atmospheres and attitudes. Guardians Of The Galaxy went on to confirm this later in the summer. And collectively, the two films raised expectations for what Marvel movies could be. It’s up to the films that follow to determine whether they’re the exceptions or the new rule.